Palladium Plain Fitted Wedding Ring — Form Bespoke Jewellers Ltd.
A perfect-fit palladium plain fitted wedding ring. This bespoke fitted wedding ring is part of a Palladium Matching Wedding Ring Set. The customer returned to us for their wedding ring as they needed a handmade piece that would sit perfectly alongside their engagement ring’s unusual profile. 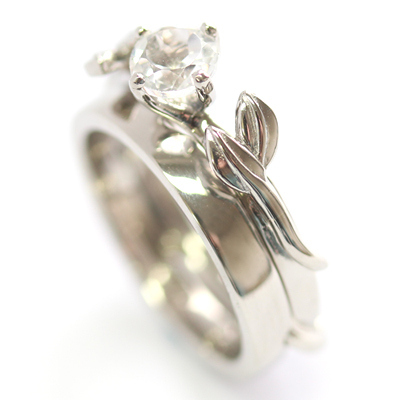 As a bespoke jewellers, this is one of our specialities. So as not to detract from the engagement ring, the customer decided on a plain fitted wedding ring. The ring is cast in trendy palladium, chosen to match the customer’s engagement ring and also the groom’s ring: a Palladium Opal Engagement Ring.